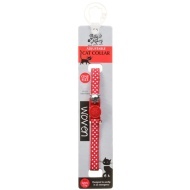 This cat collar is fully adjustable, fits most cats and features a safety clip designed to unclip in an emergency. Velvet, Woven & Printed collars also available. For more great Cat Accessories at B&M, check out our range online and buy in stores.